Protect your customer’s dream car with one of the industry’s most inclusive programs. A collector car’s age, rarity, value, unique features, limited use, availability of parts and services can make it a unique scenario to cover. Customers will love the agreed value total loss settlement, the usage-defined premium and the true under-the-hood expertise that only American Modern offers. And you’ll love how easy we make it to quote and handle a claim. Vehicle must be stored in a secured facility. Use of the vehicle must be consistent with that of a typical hobbyist or enthusiast. We anticipate annual driving to be around 3,000 miles. AMsuite Only: Homeownership, multiple policy,paperless policy and more discounts avaiable. The program includes bodily injury, property damage, collision, comprehensive and uninsured motorist. Depending on your state, it may include medical payments and personal injury protection (no-fault). A car can be worth more than the depreciated value listed in a price book. Once we agree on a value for your prized possession, that’s what your customer will get in the event of a total loss. There’s no depreciation or questions. One liability charge – flat rate regardless of the number of vehicles on the policy. Trip interruption – up to $150 per day is reimbursed for transportation, loading, and expenses if the vehicle becomes disabled more than 50 miles from home for at least 24 hours. Collector coverage – Any new addition to a collection, valued up to $50,000, is covered for 30 days to allow time to formally add the car to the policy. Collectors can increase the limit. Appreciation Security – Inflationary coverage for the value of the vehicle. If selected, value of vehicle will increase according to inflation factor at renewal. Underwriting approval required. Automobile Coverage — Provides coverage for signs, gas pumps, and other automobile collectibles. * Think of mileage plans as discounts. They give your customers flexible driving options and a lower rate. Medical payments – add coverage for basic medical care without a liability determination. Q: What is the target market for this program? A: Our product is designed for collector car hobbyist and enthusiast who utilize a “collector” vehicle on a limited basis for activities such as exhibitions, club activities, parades, and the occasional pleasure/leisure activity. Q: What types of vehicles do you insure? A: We cover Antiques, Classics, Late Model Collectibles, Exotics, Street Rods, Hot Rods, Replica/Kit cars, Collector Trucks, Classic and Custom Motorcycles, Race Vehicles, Military vehicles, Fire Engines, and a variety of other collectible vehicles. Q: Do you write vehicles under restoration? A: We will accept vehicles undergoing active restoration with underwriting approval. Q: What settlement options are available? A: We offer both Agreed Value and Stated Amount on all of our vehicles. Q: Are there any annual mileage restrictions? A: Our broadest option is our Unlimited Mileage plan, but for those consumers who don’t use their vehicles that often we offer the ability to select down to a 6,000, 3,000, or 1,000 mileage plans. Any unused miles will “rollover” to the next year and consumers can increase their mileage plans if their driving habits change. Q: Are there any restrictions regarding the usage of the vehicles? A: The rates available through the Collector Vehicle program are substantially less than that of a standard auto policy with comparable coverage. In order to allow such a reduced rate, we are looking to insure risks who use their vehicle on a limited basis for activities such as exhibitions, club activities, parades, and the occasional pleasure/leisure activity. Additionally, the collector vehicle cannot be your regular use vehicle, nor used for daily usage or regular commuting to work. Q: Is there any flexibility to drive the vehicles to/from work? A: Regular commuting to work is not allowed; however, we have the ability to accommodate the discerning risk that occasionally commutes to work in their collector vehicle. If a customer is looking to commute more than twice per week, they would likely be better served by another company. Q: Does the policy include towing? A: We do include $75 to cover towing cost at no additional charge. We also offer a Nationwide Roadside Assistance Program which expands the towing coverage to $200. This extended coverage also includes guaranteed flat bed towing, lock-out assistance, fuel delivery, as well flat tire assistance, and is all available 24 hours a day. Q: Are there any storage requirements on these vehicles? When not in use, all insured vehicles are required to be stored in a locked, fully enclosed garage facility. When the vehicle is at overnight events, the vehicles are not required to be stored in a fully enclosed locked garage facility; however, the owner is expected to exhibit a high level of due diligence to ensure the protection of the vehicle. Carports are acceptable; however, they are subject to a surcharge and may require underwriting approval. Q: Is full safety glass coverage offered? A: This coverage is available in all states. In some states, this is automatically included at no extra charge. Q: Are there any car club/affinity group discounts? A: Yes. We do offer a discount if the insured is a member of an approved car club/affinity group. Q: Are there any discounts for larger collections? A: Yes. We do offer Unique Risk Discounts, for collections of vehicles (more than on vehicle) with a total value of $150,000 or higher. These discounts are based primarily on the storage of the collection and include: Dispersed Risk, Security Measures, and Fire Resistant Storage Structures. Q: Can I do a liability only policy? A: No. Liability only policies are not allowed. 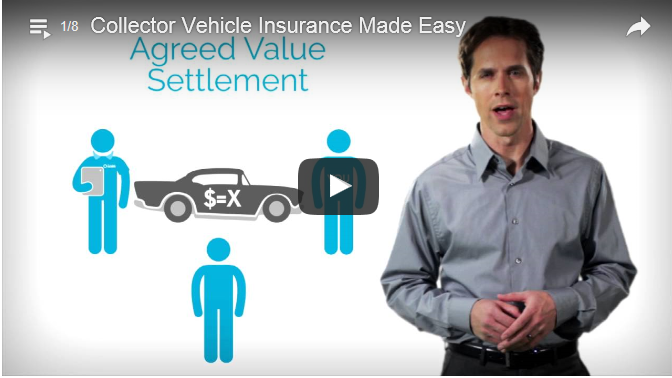 All Collector Vehicle policies are required to carry Other Than Collision coverage. Depending on your state Physical Damage only coverage may be available. Q: What policy terms are available? A: All Collector Vehicles Policies are written for a term of 1 year. Program details may vary by state. For specifics, please log in to modernLINK and consult the program manual for specifics located under the eForms tab. 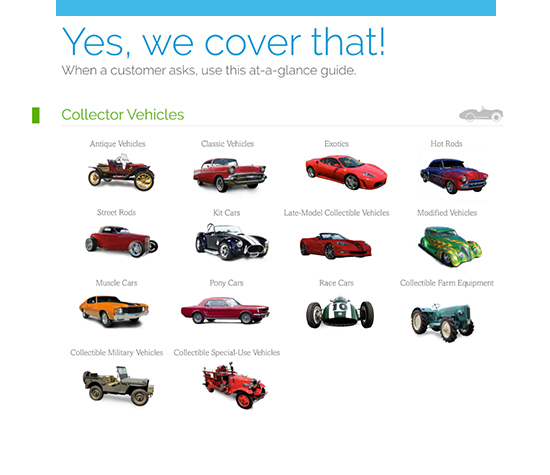 See all of the collector vehicles we cover.